In front of me, everything seemed alive; the huge plow, which had been standing near by the house without my having observed it in the night, seemed to shake itself, turn around, swung its arms, creaked - and began to move back southward whence it and we came, tearing up the vegetation, ploughing the ground beneath the wrenched-out plants and shrubs. All around me were machines, busily at work, machines that threshed and winnowed grain... A picture of machines and no man to control or watch them! 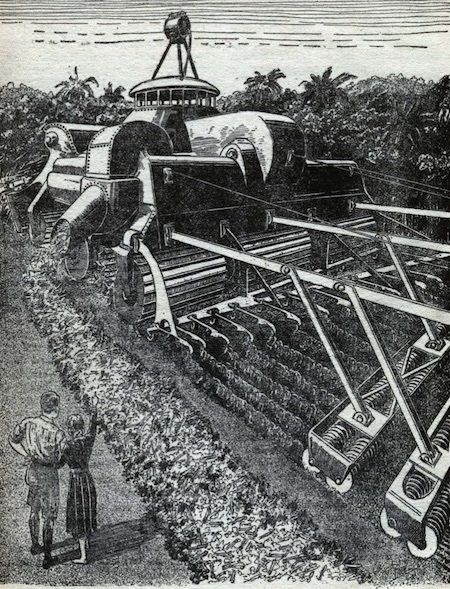 Machines that seemingly with full consciousness walked out into the fields to do their daily work. And even now there was no living being among them save myself... Had these machines in some incredible fashion been provided with brains? From The Hidden Colony, by Otfrid von Hanstein.